As parents of a five year old, we take great pleasure in reading to our son. We delight in his growing comprehension of the world of words. His teachers encourage us to point out signs as we walk through Harlem, our home, and speak aloud the names of businesses and streets. We do. On Monday, we walked together down Lenox Avenue. I pointed out Jimbo's Hamburgers. Then a bodega that boasts a grocery and deli. I pointed out Chai Walla, a new tea spot that dazzles with holiday light. Then I stopped. I hurried around the corner of 123rd hoping my son could be shifted onto a new topic without notice. Why? Because the ATLAH sign came into our vision. Last year, the sign said "Jesus would stone homos...stoning is still the law." Last month, the sign read: "Obama is a Muslim. Muslims hate fags. They throw faggots off buildings. The bible says throw them off too." When ATLAH Missionary Church, lead by James David Manning, posted that first stoning sign, several neighbors and friends organized. We formed Harlem Against Violence, Homophobia, and Transphobia and decided that instead of direct protest, we would fundraise for a local nonprofit that helps some of the biggest victims of Mannning's hate speech: homeless LGBTQ youth. We raised over $17,000 for the Ali Forney Center, whose intake center is only a few blocks away on 125th. They need all of the funds they can raise. Kids coming out as LGBTQ are getting kicked out of their homes at a terrifying rate. Can you imagine what it's like for a young person told at home he or she is going to hell for being who they are, and then have to see these signs? We hurt for these young people. We hurt for persecuted people of all ages who encounter hatred in the heart of Harlem. We hurt because we know bullying, assault, and murder are fates too many of our neighbors--of all ages, races, religions, and national origin--must fear when they walk through the neighborhood. We hurt because today is also TDOR - Transgender Day of Remembrance. And we remember that less than two years ago, Islan Nettles was murdered on a Harlem street. ATLAH acts like a neighborhood bully. For years, they've posted hateful messages against President Obama, black people in general, electeds and leaders they didn't approve of. Despite the vile words, we knew that in the eyes of the law, Manning was protected. But once he called for the public murder of members of a persecuted community? We knew silence was no longer an option. Silence equaled complicity. In October, Manning posted a sign declaring the right Christian thing to do was to "throw faggots off buildings". We knew we had to respond directly. We organized a candlelight vigil. This would be the night that Manning came out, screaming at us in front of his cross. The video went around the world. "The messages displayed by the ATLAH Church are not reflective of this community, but are grossly offensive hate speech that have no place in the streets of Harlem. Today, humankind finds itself surrounded by the tragedies of war. In upper Manhattan and abroad, we are crippled by problems of inequality. Record-high debt is ensconcing countries, communities, families and individuals. There is no time or attention left to spend spreading a message of bigotry. 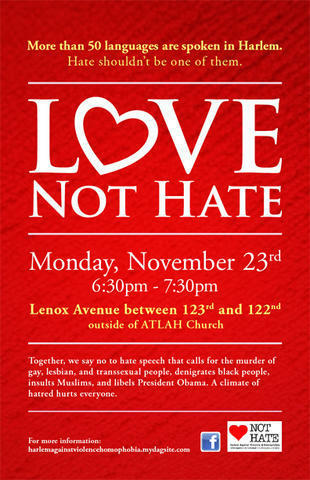 Today, the truest members of the Harlem community ‎are speaking up and we reject this display of hatred by ATLAH Church." We resist these streetcorner threats as we turn on the TV and see Donald Trump and other GOP presidential candidates strut and squawk like global bullies. We click on news articles to find Trump calling for mass deportations of undocumented people, mass registrations of Muslims, and shutdowns of mosques. We get sick to our stomachs because we think Gestapo. We think yellow stars. We think internment camps. We think of the horrors and shame of global history being repurposed for GOP voter titillation. All the while, those in the crosshairs of these hateful ideas have to worry how much is bluster, how much is reality, and who around them won't wait for policy change to become a willing executioner. We appreciate Member Wright, Councilwoman Inez Dickens, Borough President Gale Brewer, and other electeds who have shown the community strong support in the face of hate speech. We work in solidarity with other local activists including Jennifer Louise Lopez, Brooke Cerda, Michael Henry Adams, Dr. Wilhelmina Perry, Tanya Domi, wish special gratitude to Manny Rivera of the LGBT Taskforce and Carmen Neely of Harlem Pride. In Harlem, we know hate hurts. No matter if the hatred comes from a streetcorner demagogue, or a candidate for presidency of the United States. Hate words have a way of turning into hate actions. Every soul is precious. No one is disposable. We have to stand up for the safety and dignity of everyone in our community. Join us on Monday so the world knows that it's time for #LoveNotHate.